Gresham Glass is a trusted source in Gresham & Portland East County for you glass needs. 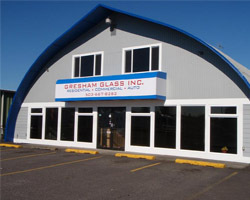 If you are looking for glass in Gresham, look no further than Gresham Glass. Our locally-owned glass company has been serving the area for the last 37 years with an emphasis on quality. Our experience and our hometown service feel have made us one of the leading glass providers for several different industries in the area. Here at Gresham Glass, we can handle both your commercial and residential glass needs. We specialize in all types of glass so that you can get the finished product that you are looking for. Some of the glass products that we specialize in include: shower doors, mirrored wardrobe doors, specialty glass, cabinet glass, glass desktops, tabletops, glass shelves, and much more! Our glass services are completely comprehensive, which means that you won’t have to go anywhere else to have your glass needs met. This means if you have something break in your home that is a glass product, Gresham Glass has got you covered. We know that customer satisfaction is what has kept us in business these 37 years, and we strive for this satisfaction every day. Our friendly technicians are experienced and skilled at what they do. This means that your repairs or installations will get done promptly, and right the first time. This not only can give you peace of mind, but it can also save you time and money as the job will be done correctly. If you have a commercial glass storefront application that is broken or that needs repair call us. In the case that the glass needs to be specially ordered and is not in stock, our technicians can board up the entry way in order to keep your business or commercial building secure until the new glass product is installed. Our willingness to go the extra mile to keep our customers happy has built quite a positive reputation for Gresham Glass. As you can see, Gresham Glass has all of your glass needs covered. As a comprehensive service provider, come and see us today for any glass work you need at your home or office. We promise to provide you with the highest quality products so that you can get the glass that you deserve. Contact us today for all of your glass needs.